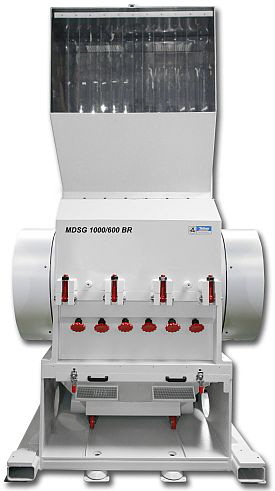 Hellweg Maschinenbau GmbH & Co. KG presents at K 2016 its new high performance granulator MDSG 1000/600 BR (“BR” stands for “Brocken”, the German word for lumps), which works on the peeling cutting principle and has been constructed for single-stage shredding and granulation of solid start-up blocks and pipes & sheets. The machine has been designed as a robust welded construction and is fitted with a solid peeling cutting action rotor. It is able to process, in a single stage, heavy start-up lumps as well as pipes and sheets in wall thicknesses of, for example, 500 mm into granulate characterised by its homogeneity and freedom from dust. The geometry of the blades used enables a cutting principle known as the so-called “peeling cut”, combined with limitation of cutting depth, This prevents the rotor blades from cutting too deep into the plastic material to be granulated. Material is simply “peeled off” from lumps, as this prevents rotor blockage and guarantees fast, quiet and energy﷓saving shredding and granulation. With 1,000 mm working width, the 12-bade U-CUT rotor has 600 mm diameter and it can be sharpened a number of times by regrinding. The rotor is produced from a single solid piece of steel and weighs approx. 4,000 kg. The overall weight of the machine amounts to approx. 11,000 kg. Depending on the material to be granulated, achievable throughput ranges amount to between 800 and 3,000 kg/h, allowing for 5-20 mm diameter sieve perforation and 75-90 kW installed power rating. Complete noise protection cabins as well as feeding equipment for sheets and pipes are available as options. Hellweg Maschinenbau GmbH & Co. KG constructs its own machinery and equipment, especially also for individual custom tasks, for customers in the plastics and recycling industries throughout the world. The production programme consists of standalone and machine-side granulators, edge strip granulators, feeding equipment and film cutters, as well as extraction and dust removal equipment, inclusive of associated accessories. Hellweg granulators are used by plastic processing companies to compound thermoplastic waste arising from production – especially engineering plastics such as ABS, PE, PA, PA 6, PA 66 GF, PC, PP, PET, PVC, POM, but also TPE and EPS, involving dosing of ground material again with virgin material during runningproduction, or addition of the material in another application at a later stage. 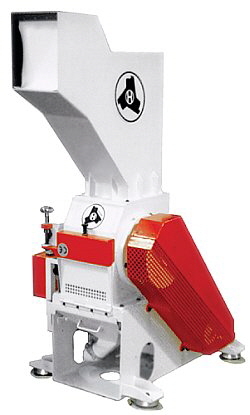 The material to be handled falls into the cutting chamber of the Hellweg granulator via a guiding chute and is repeatedly shredded by cutting between rotating and fixed knives, until it passes an attached sieve as ground material. The sieve extends over the lower half of the grinding chamber and is exchangeable. This enables appropriate sieve perforation to be used for the particle size required. Visit us at the K show. We are looking forward to welcoming you on our stand (hall 11, stand B39).